GIS investment can be applied to unite the information and service functions of various departments to display and analyze data. Communities can invest in GIS to help respond to challenges, enhance business functions, increase efficiencies, improve service delivery, and plan for the future. GIS applied to asset management can facilitate data collection, processing, and display but can also integrate asset mapping with project management and budgeting tools so that maintenance, inspections, and expenses can be accounted for in the same place. NewCom has knocked down the walls that may keep communities from the immediate payback of GIS-based infrastructure management – SeeCity is the entrance that you’ve been looking for. Based on the ESRI ArcGISTM technology, SeeCity offers communities an inexpensive entry to GIS documentation and management of a community’s critical infrastructure information—top to bottom and everything in between is shown on screen. With GIS you leverage your initial investment for other uses. If you create a Geographic Information System for any reason (to document streets and sidewalks, utilities, parcel data, cemetery) you have the start of the most powerful data management tool in the industry. you started easily and economically whether your choice is to invest in GIS incrementally or to go big. In 2003, NewCom began to focus software development efforts on the needs of municipalities, who were under pressure by un-funded mandates to responsibly manage publicly owned assets. NewCom Technologies, is a woman-owned Iowa business. 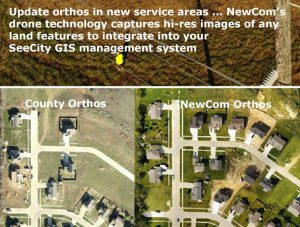 Since 1998, NewCom has converted more than 50,000 miles of facilities to GIS and documented millions features for private utilities and city-owned facilities — broadband networks, telephone, electric, gas, water, sewer, storm sewer, as well as other land features such as trees, LUST, flood zones.